Our annual report, The State of the Nation’s Housing 2013, issued last June, documented the growing evidence of a solid recovery in the housing market, marked most visibly by widespread increases in home prices and rebounding construction activity. But the report also cautioned that the good news of the long awaited recovery in housing markets should not overshadow the distressing news that the number of Americans with severe housing cost burdens—that is, spending more than half their income on housing—remains at unprecedented levels. In fact, in 2011 the number of households with severe housing cost burdens reached a new record of 20.6 million, an increase of 2.6 million since the Great Recession began in 2007. But the deterioration in affordability was even worse during the housing boom years, with the number of families and individuals devoting more than half their income for housing costs up by 4.1 million between 2001 and 2007. Overall, from 2001 to 2011 the total number of severely cost burdened households soared by 49 percent. The timing of these increases has differed somewhat between owners and renters (see figure). 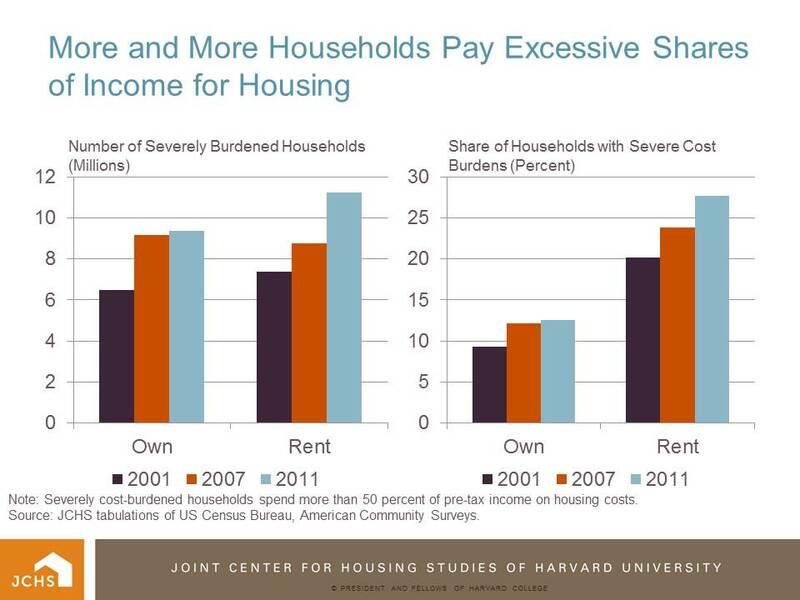 Among renters, the number of severely burdened households increased between 2001 and 2007, but really accelerated in the aftermath of the recession. Between 2007 and 2011 alone the number of severely burdened renters increased by 2.5 million, pushing the share with severe burdens to 27.6 percent. Among homeowners, however, almost all of the increase in severe cost burdens over the past decade occurred during the boom years from 2001 to 2007 when buyers stretched to afford rapidly rising home prices. While conditions among owners has not gotten much worse since then, it is remarkable that things have not gotten appreciable better given the substantial decline in home prices and interest rates that have occurred. The lack of progress reflects the fact that many owners remain locked into large mortgages taken out at the peak of the market, with many missing out on opportunities to refinance either because they owed more than their homes were worth or because their incomes or credit history would not qualify them for a new loan. However, we may finally be seeing some improvement in affordability as the economic recovery continues. Complete information on trends in severe housing cost burdens through 2012 will be available next month when detailed data from the 2012 American Community Survey is released. But the initial data made available in October shows that the number of renters with at least moderate cost burdens (paying more than 30 percent of income for housing) rose only slightly last year, ending years of steep increases. The news was even better for homeowners as the number of at least moderately burdened homeowners was actually down by about 8 percent. Still, we have a long way to go to make up the ground lost over the last decade. Even with interest rates rising, many homeowners would still benefit from refinancing to lower rates. The HARP program extends this option to underwater borrowers with loans guaranteed by Fannie Mae and Freddie Mac, but those with loans without government backing continue to have limited options. Among renters what is most needed to improve housing affordability is more robust employment growth to boost household incomes. But there is also a need for an expansion of housing assistance efforts to help the nation’s most vulnerable households obtain housing that does not strain their budgets. Even before the recession only one in four income eligible households were able to secure assisted housing and in the last few years this share has dropped even further. Given the importance of decent and affordable housing for an individual’s overall well-being, there is a compelling need for increased efforts to address the long-standing housing affordability problems facing the country. Christopher Herbert is the managing director at the Joint Center for Housing Studies of Harvard University. The center, a collaborative venture of the Graduate School of Design and the John F. Kennedy School of Government, conducts research on the nation’s most critical housing and urban issues.